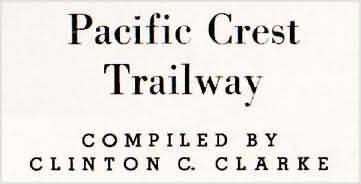 The Pacific Crest Trailway was one of the first books ever published about the Pacific Crest Trail. This book was compiled by Clinton C. Clarke and published in 1945. As Mr. Clarke notes that this material "was obtained through 13 years of research and exploration by officials of the National Park Service and the National Forest Service, scientific and nature organizations, and capable explorers who covered all the regions of the Pacific Crest Trailway." This book is very rare and has been out of print for 74 years. I decided to make an online version of the book since most PCT hikers like to read about anything they can find about the trail. I believe the version I have here is complete. The 126 page book comes with a series of maps running from Mexico to Canada. 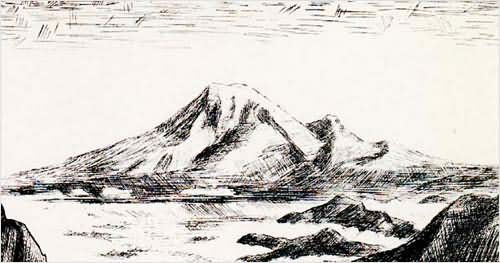 In addition to the maps, 12 pen & ink drawings are included of such places as Mt. Whitney, Mt. Adams, and Rae Lakes. I came across a copy of The Pacific Crest Trailway in 1998 and decided to create an online version of the book. For technical reasons (see below), 98% of this book is in graphical form. Most of the individual book pages and maps are 100-200kb in size, so a faster Internet connection will help. Thanks to Steve Platzer for sending photocopies of the "Index Map" and a "catalog card" found in the front of the book, which I scanned in 2004. These were missing from the version of the book I scanned. This book is quite an interesting read. Many of the words used in the book seem to have fallen out of the English language. Most people today don't carry 52 pound backpacks and sleep on a bed of pine needles six inches deep. The Pacific Crest Trail is about 510 miles longer than it was in 1945. I found it very ironic that in 1945, Mr. Clarke wrote that "our wildernesses are about gone." The discussion about the "over-mechanization" on page 21 was also something I didn't expect to see. This is actually Mr. Clarke's third book on the PCT. Thanks to Carl Siechert for pointing this out in an email to me. More information about this book can be found by searching the Library of Congress's website. Follow the link and do an author search for "Clarke, Clinton C.". A reference to this book also appears in a doctoral dissertation by Glynn Wolar. Technical stuff: My original intention was to scan and OCR (Optical Character Recognition) the entire book. The results were less than terrible. Since hard discs are cheap nowdays, I figured a 26 megabyte website wouldn't hurt anything. During two very long days in December 1999 scanning in the contents of the book. I tested various platforms in order to come up with a decent scanning resolution for the pages. I built the web pages in August 2000 and wrote a few perl scripts to generate the individual webpages for the maps, illustrations, and book pages. These webpages were created as mother nature intended, with a telnet window and UNIX Emacs!